This month's Mixology Monday theme, "From Crass to Craft" (MxMo LXXI), was picked by Scott Diaz of the Shake, Strain, & Sip blog. Scott's challenge was, "The evolution of the cocktail has been a wondrous, and sometimes, frightful journey... But with all this focus on 'craft' ingredients and classic tools & form, it seems we have become somewhat pretentious... Remember, the bar was created with pleasing one particular group in mind: the guest. As such, this month’s MxMo theme... will focus on concocting a craft cocktail worthy of not only MxMo but any trendy bar, using dubious and otherwise shunned ingredients to sprout forth a craft cocktail that no one could deny is anything less... So grab that bottle of flavored vodka, Jägermeister, cranberry juice, soda, neon-colored liqueur, sour mix, or anything else deemed unworthy of a craft cocktail, and get mixin'!" As I was discussing the theme with Scott a month or so ago, I already had the idea of doing something with Jägermeister especially after my experiences with it Portland Cocktail Week. One of the events that week was a Jäger-sponsored Tankz Und Dränkz night that I was hoping would portray the liqueur in a good light. 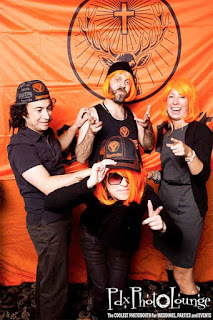 While it was fun, it certainly did not bestow any great level of dignity to this age old spirit, nor do I look good in an orange wig. 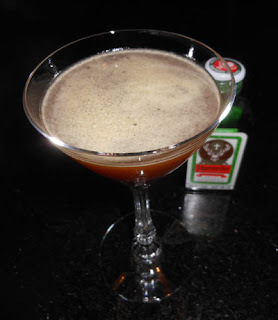 Although the Jäquiris served that night by Jeffrey Morganthaler out of a frozen Daiquiri machine weren't bad; in fact, Morganthaler has listed Jägermeister and the Jägerita as one of his five guilty pleasure drinks. The true dignity that was bestowed to Jägermeister during Portland Cocktail Week was during Tad Carducci and Todd Richman's Blinded by the Dark talk on herbal liqueurs. Beside the better known amaro category were examples of kräuterlikör with the only major difference being one is made in Italy and the other in Germany. 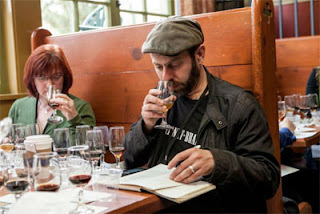 In this tasting session, Jägermeister held its own, and it was easy to forget all of the negative connotations (even if the company revels in some of it for marketing purposes). For a direction, I thought about the success of Kitty Leroy and other pineapple-amaro paired drinks, and I figured that the rich caramel and herbal notes in Jägermeister would similarly work well with pineapple. When I considered spirit-pineapple recipes to riff off of, I remembered my love of Algonquins which I made quite frequently during the summer of 2007. Instead of the 3 parts rye, 2 parts pineapple juice, 1 part dry vermouth that I enjoy, I figured that I would need to dry out the liqueur here and I upped the dry vermouth to a 2:1:1 ratio; indeed, this ratio is the one presented in Gary Regan's The Joy of Mixology that he acquired from Ted Haigh. For a name, I searched for fancy hotels in Germany with a grand literary linkage like the Algonquin Hotel and its witty Round Table; however, I was unsuccessful. But when I mentioned the Adlon Hotel, Andrea related how she enjoyed a $150 lunch there during a business trip once, and how ritzy the place was. That seemed like as good a name as any. On the nose, the Jägermeister and dry vermouth donated an herbal, minty, and almost gentian aroma that worked well with the pineapple notes. The pineapple continued on into the sip where it paired elegantly with the liqueur's caramel. Next, the swallow offered herbal and pineapple flavors with a lingering mint-like note similar to the one from the nose. So thank you to Scott for not only hosting this month's Mixology Monday but for getting me to use one of the neglected bottles on my shelf and for letting me try to shine an honorable light onto a much maligned liqueur in the craft cocktail world. Cheers!